The latest generation 6-25G is now being extended into the capacity class ISO 4 with capacities ranging from 6 ton / 600 mm load center up to 14 ton at 600 mm and various chassis widths for all truck sizes. Mast integral versions are available for an optimum of visibility and forklift truck residual capacity. The heavy-duty fork positioner is also designed to work with extreme long forks. 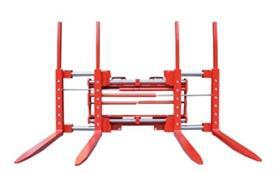 The fork carriers are pre-drill as standard for easy retrofitting of bolt-on forks. The only fully encapsulated guide system, the MEYER Shaft Guide Concept, with long-life life require a minimum of maintenance, which, with its optimised TCO, predestines this Multiple Pallet Handler design for full-maintenance and fleet operations. MEYER also offers an all-function Auto-Lubrication for the fork adjustment and sideshift functions to allow for maintenance intervals of 2,000 working hours and more. SILVER LINE is a range of reliable and cost-effective products, suitable for applications in many industries, particularly where operators require high performance and efficient cost. Most of the SILVER LINE products are available from the BOLZONI Group warehouses located worldwide. One of the major reasons for damage on sensitive home appliances is the wrong clamping force. Each product or load schema requires an individually adjusted clamping force to avoid load damaging or slipping. MEYER and BOLZONI AURAMO present a new system for equalisation of the clamp force over the large surface pads and various features for damage prevention, from basic mechanical pressure setting solutions to highly advance Sensor Control Systems. With many decades of experience in paper, pulp and recycling logistics, BOLZONI AURAMO combine product development expertise and trends in the logistics industry with customer demands into a state-of-the-art product range for efficient and damage-free handling solutions for each steps of the complete paper logistics chain. MEYER and BOLZONI AURAMO offer High Quality Forks, telescopic forks and further value adding options for applications with fork positioners: forks are delivered from the extensive stock within 24 hours, bolt-on executions within three to five working days, on request next day, offering a maximum of service support for the use in fleet and full maintenance operation. Special slip protection coatings are now also available and are being presented on this years LogiMAT. 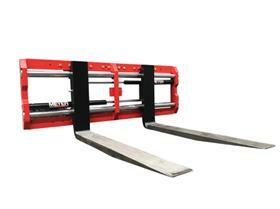 Next to Forklift Truck Attachments and Forks, BOLZONI AURAMO offers a wide range of high quality Lift Tables. This third product segment offers many value-adding solutions to logistic processes. - see more at LogiMAT 2019. MEYER and BOLZONI AURAMO exhibit from 19th to 21st February 2019 in Hall 10, Stand No. G63, on the LogiMAT in Stuttgart.